Cook the pasta then toss everything together for this fast dinner recipe. 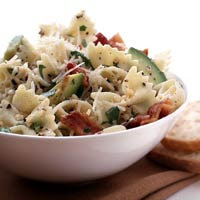 Meanwhile, in a large bowl combine the avocados, bacon, basil, lemon juice, olive oil, garlic, pepper, and salt. Add the hot pasta and toss to combine. Transfer to a serving bowl. Sprinkle with cheese. Makes 4 servings. Calories 491, Total Fat 26 g, Saturated Fat 6 g, Monounsaturated Fat 15 g, Polyunsaturated Fat 3 g, Cholesterol 18 mg, Sodium 358 mg, Carbohydrate 50 g, Total Sugar 3 g, Fiber 6 g, Protein 15 g. Daily Values: Vitamin C 20%, Calcium 14%, Iron 21%. 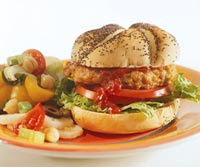 Use a portion of the chickpeas from a 15-ounce can for these chicken burgers; then use the remaining chickpeas to make a hearty chickpea side salad. In a medium mixing bowl combine mashed chickpeas, egg, bread crumbs, Cajun seasoning, and salt. Add ground chicken and mix well. Shape into four 3/4-inch-thick patties. Preheat oven broiler. Place patties on an ungreased, unheated rack of a broiler pan. Broil 3 to 4 inches from heat for 6 minutes. Turn patties; broil 6 to 8 minutes more or until an instant-read thermometer inserted in side of patty registers 165 degrees F. Toast rolls under broiler, if desired. Serve patties in buns with lettuce leaves and tomato slices, if desired and serve with chili sauce, taco sauce, or catsup. Makes 4 servings. Prepare burgers; cover and chill up to 4 hours. To make your own Cajun seasoning, in a container with a tight-fitting lid combine 2 tablespoons salt, 1 tablespoon ground red pepper, 1 teaspoon ground white pepper, 1 teaspoon garlic powder, and 1 teaspoon ground black pepper. Store, covered, at room temperature. Makes about 1/4 cup seasoning. Calories 338, Total Fat 10 g, Saturated Fat 2 g, Cholesterol 108 mg, Sodium 653 mg, Carbohydrate 36 g, Fiber 1 g, Protein 25 g. Daily Values: Vitamin A 5%, Vitamin C 1%, Calcium 7%, Iron 23%. 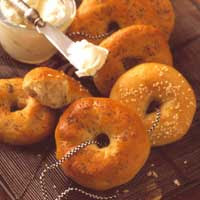 Make bagels at home! Discover how to get that distinctive chewy texture by boiling before baking. 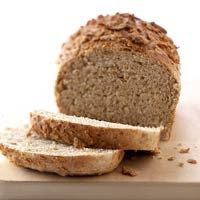 Add first 6 ingredients to a 1-1/2- or 2-pound bread machine according to the manufacturer's directions. Select the dough cycle. When cycle is complete, remove dough from machine. Punch down. Cover and let rest 10 minutes. Meanwhile, in large pot bring 6 cups water and 1 tablespoon sugar to boiling. Reduce heat. Add bagels, 4 or 5 at a time, and simmer for 7 minutes, turning once. Drain on paper towels. (If some bagels fall slightly, they may rise when baked.) Place on a well-greased large baking sheet. Mix the egg white and the 1 tablespoon water; brush over bagels. If desired, sprinkle with poppy or sesame seeds. Bake in a 375 degree F oven for 25 to 30 minutes or until tops are golden. Remove from baking sheets; cool on racks. Makes 9 bagels. 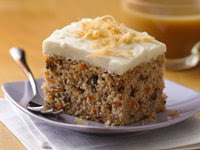 Calories 183, Total Fat 2 g, Saturated Fat 1 g, Cholesterol 0 mg, Sodium 186 mg, Carbohydrate 35 g, Fiber 1 g, Protein 6 g.
A chocolate crumb crust, a creamy pudding layer, and fudgy frosting make these dessert bars irresistible. Line a 13x9x2-inch pan with foil, extending foil over the pan edges. Set aside. In a medium saucepan, heat 1/2 cup oleo over low heat until melted. Stir in granulated sugar, cocoa powder, and egg. Cook and stir over medium-low heat for 3 to 4 minutes or until blended and slightly thickened (160 degrees F), whisking constantly. Remove from heat; stir in vanilla. Stir in graham cracker crumbs, coconut, and nuts until well combined. Press mixture into prepared pan; chill. For middle layer, in a small bowl, combine the milk and vanilla pudding mix; set aside. In a large bowl, beat the 1/2 cup softened oleo with an electric mixer on medium speed for 30 seconds. Beat the pudding mixture into the oleo until combined. Beat in 2 cups powdered sugar until smooth. Spread over cooled layer in pan; cover and chill for 30 minutes or until firm. For top layer or frosting, in a microwave-safe bowl, combine the 1/4 cup oleo and chocolate pieces. 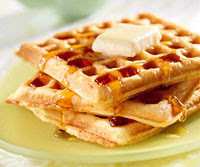 Microwave on 50 percent power (medium) for 45 to 75 seconds or until melted, stirring every 30 seconds. Cool slightly. 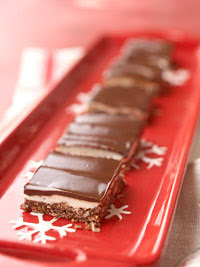 Spread frosting evenly over the chilled bars. Chill until firm. Using the edges of the foil, lift the uncut bars out of the pan. Cut into bars. Makes 48 bars. 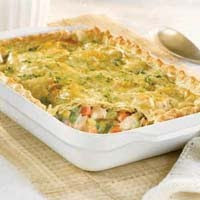 Tender chicken and mixed vegetables are bathed in gravy made with Swanson® Chicken Stock, then topped with a Pepperidge Farm® Puff Pastry crust that has been dusted with chopped fresh herbs. Thaw the pastry sheet at room temperature for 40 minutes or until it's easy to handle. Heat the oven to 400 degrees F. Stir the egg and water in a small bowl with a fork. Stir the chicken and vegetables in a 13 x 9 x 2-inch baking dish. Heat the butter in a 2-quart saucepan over medium heat. Add the flour and cook for 3 minutes, stirring constantly. Gradually stir the stock into the saucepan and heat to a boil. Reduce the heat to low. Cook and stir for 3 minutes or until the mixture boils and thickens. Stir in the black pepper. Pour the stock mixture over the chicken mixture. Unfold the pastry sheet on a lightly floured surface. Roll the pastry sheet into a 13 x 9-inch rectangle. Place the pastry over the filling. Press the pastry sheet to the edges of the dish to seal. Flute the edges of the pastry, if desired. Brush the pastry with the egg mixture and sprinkle with the herbs. Cut several 2-inch long slits in the pastry top. Bake for 25 minutes or until pastry is golden and the filling is hot and bubbling. 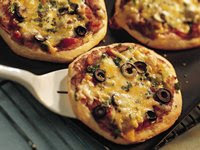 These individual pizzas are great for a snack or light lunch, and the recipe doubles easily. Heat oven to 350 degrees . Unroll biscuit dough. Press or roll dough into 5-inch circles on ungreased cookie sheet. Spread dough with bean dip. Top with salsa, chilies, onions and olives. Sprinkle with cheese and cilantro. Calories 185 (Calories from Fat 100); Total Fat 11g (Saturated Fat 5g); Cholesterol 20mg; Sodium 570mg; Total Carbohydrate 16g (Dietary Fiber 1g); Protein 6g.